Bryon Smith does not expect readers to believe his story, at least at first. It is, after all, the stuff of fantasy: a spirit contacts him from the afterlife and reveals an astonishing theology that explains humanity’s experiences in life and death. In Living Beyond Existence, Smith tells how a regular guy from Fremont, California, received this message from beyond through his wife, Shannon, a psychic medium. Together the Smiths have written a book that documents their unique experience and offers readers a new take on the age-old questions of life after death. Bryon is the book’s main narrator, and he takes readers back to 1981, when his cousin Kirby died in a car accident eerily similar to the crash Bryon had dreamed of just six months earlier. The apparent premonition shakes Bryon. He proceeds to have several near-death experiences after Kirby’s death and gradually becomes more and more receptive to the idea of spirit communications. Still, it is over twenty-five years later when Shannon tells him she is in contact with Kirby and that he has a lot to say. Living Beyond Existence is a clearly written description of a five-hour session in which Bryon is able to ask Kirby questions through Shannon. 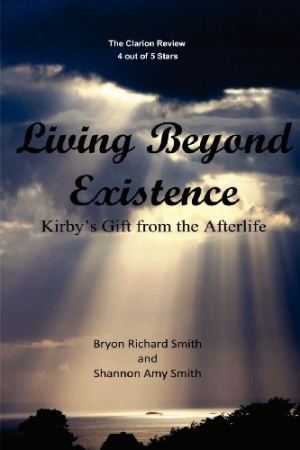 Kirby addresses inquiries about animal souls, the existence of hell, and whether there is life elsewhere in the universe. Bryon’s questions focus on religious issues, and he comes away with a catalog of sorts, listing the types of souls in existence and their roles during life and after death. Karma and reincarnation are central to the new philosophy Bryon records. The Smiths felt compelled to share their new knowledge with the world in spite of the skepticism they knew would arise. Bryon spends an entire chapter recounting the personal, social, and medical challenges he and Shannon faced in the year after they made their story public. Their perseverance alone makes a convincing case for their truthfulness. Readers who remain uncertain of the supernatural aspects of the story will likely still believe that the Smiths themselves believe in spirits. Never a writer before this experience, Bryon has since written several volumes of poetry called The Purgatory Series, a science-fiction novel, and stories for young adults and teens. Shannon is the author of two children’s books, and has also written poetry for Bryon’s series. Several new fiction titles are in the works.